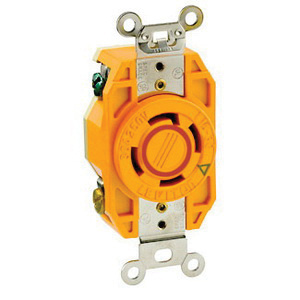 Leviton V-O-Max® Single locking receptacle in orange color, has a unique design with high impact, chemical-resistant Valox® 357 body and cover, Valox® face and base construction for long-life durability. This 3-Pole, 4-Wire receptacle features extra-thick 0.05-Inch nickel-plated brass strap and brass contacts for lasting retention. It operates at a voltage rating of 250-Volts AC, current rating of 30-Amps, temperature rating of -40 to 60 deg C and dielectric strength of 2000-Volts. It has wire restraint recess for both back and side wiring, reduces the possibility of loosening the terminal connection. It supports maximum load capacity of 3 HP. The receptacle meets UL 498 E13399, Federal Specification WC-596, CSA C22.2 No. 42, ANSI C-73 and NOM 057 standards.